The Great Philly Cheesesteak Book offers reviews of more than one hundred local and world-wide eateries, accompanied by original and creative recipes. This fun guide is sure to delight tourists and locals alike and would make a great gift idea for the guy into cheesesteaks. Also includes the DVD, This Is My Cheesesteak. 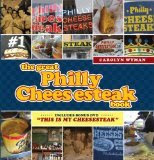 For more information about the book and author, Carolyn Wyman, visit the website: The Great Philly Cheesesteak Book.